It’s no exaggeration that the Netherlands has a lot of bikes — some numbers estimate over 18 million — because it’s one of the friendliest countries in the world to cycle in. There’s so many that most densely populated cities such as Amsterdam and Utrecht have a team of dedicated people, tagging and removing abandoned bikes constantly. A specially designated area on the outskirts of many cities, called a ‘fietsdepot‘ — bike depot in English — stores abandoned and illegally parked bikes for just six weeks before they’re sold or destroyed. As you might expect, it’s often incredibly hard to find a place to park your bike. Even though cities like Amsterdam have built enormous, multi-level bike parks, they’re constantly full and finding a place to park your bike — legally — is a nightmare. They end up chained to anything attached to the ground once parks are filled — signs, bridges and gutters are all fair game. In Amsterdam, the city actually officially ran out of bike parks this year and is desperately planning to build new facilities, including a two-story partially underwater bike park. The city of Utrecht, which has a population of 311,367, set out to solve this with a pilot system designed to help guide cyclists to places they can easily park their bikes. It recently completed installation of a system made up of digital signs around the city that display the number of parks in a way that’s not dissimilar to what you’ve probably seen for cars, though the technology behind it is a little more complex. Lumiguide, the company chosen by Utrecht to build the system showed me around the city and the technology it’s built. Bas van Dijk, Lumiguide’s CTO, told me that its system is fairly unique as it uses nothing more than a pair of high definition cameras and a computer algorithm to recognize a bike and register that a spot is occupied. There are systems already on the market, but those tend to use a switch nestled in the bike holder that can be broken, or hundreds of cameras that sits at the end of each and every park, which require constant cleaning. Lumiguide’s cameras are mounted on the roof in pairs just a few centimeters apart, and use stereoscopic vision to determine what they’re seeing. Each pair of cameras can see tens of bikes and are far easier and cheaper to implement than needing to modify each parking spot — all they need is somewhere to be mounted and single wire to a powered internet connection. The cameras relay the images back to Lumiguide’s system, which runs an algorithm over the two images and generates data on how many places are occupied as well as usage trends and other information. Perhaps the most interesting thing is these two cameras are off the shelf, and that all the magic sits in Lumiguide’s software. They’re just dumb, ethernet powered cameras, with no added smarts. For cities with bike dense populations, systems like this are a huge relief. Local governments haven’t ever had a way to measure public bike park utilization reliably in the past, so there’s been no visibility into whether more bike parks are needed, or if the amount of space leased should be reduced. Each facility gets its own live map and analytics, for continuous monitoring and measurement of a bike park’s performance. That means the city is also able to more reliably tell which bikes have been abandoned. To give an idea of the scale of the issue, more than 73,000 bicycles were removed from the streets of Amsterdam. City workers usually visually identify bikes that haven’t moved and tag them with a warning to the owner before they’re removed — but it’s often hard to know how long the bike was really there for. With a system like Lumiguide’s the city is able to know when a bike came in and automatically notify when a spot has gone stale, needing workers to remove the bike to the fietsdepot. It also encourages people to cycle more, as signs around the city show if you’ll be able to get a spot ahead of time rather than needing to worry about if you’ll have to search for somewhere secure to park. 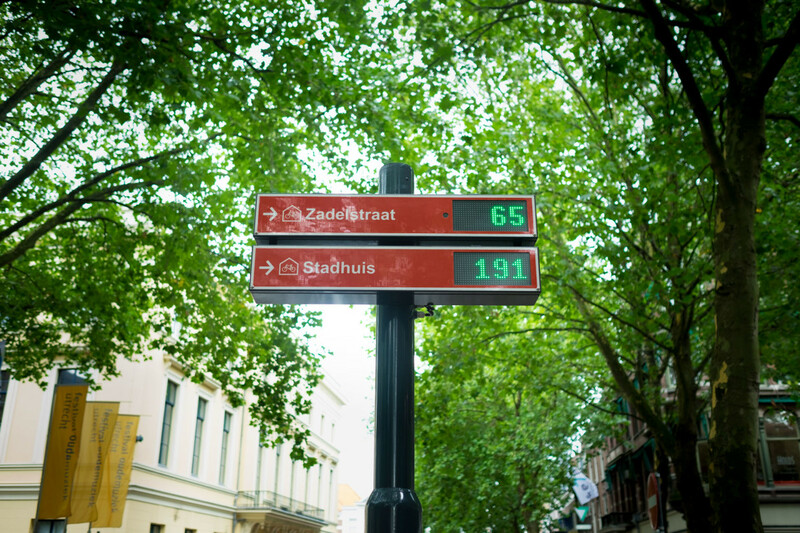 In Utrecht, there are 21 signs dotted across the city’s major cycle routes which are designed to guide cyclists to a free park. Each sign is interesting in itself — it’s connected to the internet via a 3G modem, which refreshes the status of the bike park continually without the need for a wired connection. With the use of cameras, there’s naturally a privacy element that people might be concerned about, but Lumiguide built its system with that in mind. No images or video are ever saved — they’re disposed of in real time — so privacy is maintained. The city of Utrecht is incredibly proud of the system and said earlier that it plans to expand it to over 20,000 monitored parks by 2017. More complex versions of Lumiguide’s system can provide indoor guidance to available parks for larger facilities and the company can install its detection hardware both indoors and outdoors. As cycling sees a revival across the world, Lumiguide’s system offers something that’s relatively easy for cities to install at almost a quarter of the cost and provides visual encouragement for cyclists to get on their bikes. Lumiguide says that the Utrecht trial has been so successful that other cities have started to take notice, and the company is holding discussions to bring even larger scale versions to major European centres in the near future. The bike parking system, which is something most people probably wouldn’t normally think about, is an interesting look at what smart, internet-connected devices can do to change the way people interact with a city — and encourage people to cycle more.